When purchasing medication at any pharmacy (hopefully you are getting your stuff from us!) I always recommend talking to a pharmacist first. We can make sure the product is right for you, safe for you and make sure you are getting value for the money you are spending. In recent years we have seen Health Canada move some medications from requiring a prescription to not needing a prescription. 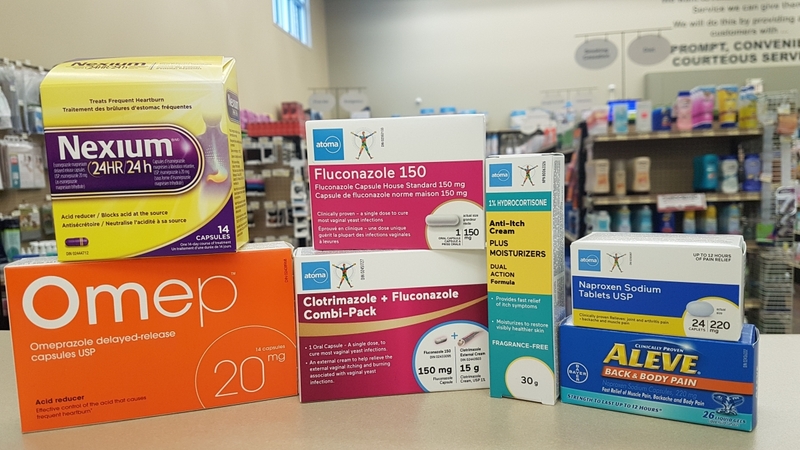 Some of these products are available over the counter (located in the front store) and some are kept behind the counter; therefore, speaking with a pharmacist is a must. Either way you might not be aware these products are available without a prescription, and it could save you a visit to the walk-in clinic. Hydrocortisone belongs to a group of medications called corticosteroids or steroids for short. No, I am not talking about the type of steroids that give you Popeye arms. Topical steroids are medical treatments that are applied directly to the skin to provide relief for a wide variety of skin conditions. This includes psoriasis, atopic dermatitis, and contact dermatitis, including mild poison ivy and itchy bug bites. For years 0.5% hydrocortisone was available without a prescription. Recently, the 1% strength became available over the counter as well. Hydrocortisone is extremely safe when applied in a think layer to clean, dry skin. It will reduce redness, itchiness and even swelling in the localized area. There should not be any open wounds on the affected area you are applying it to, and you must use caution when applying it to sensitive areas or to a baby's skin. A wide variety of medications used to treat acid reflux and heart burn are available without a prescription. However; just recently in Canada proton pump inhibitors (PPIs) became available without a prescription. PPIs are considered the most effective option for acid reflux. They are usually safe to use in the short term at the advice of a pharmacist. You do have to use caution if used long term, as they can cause bloating, deplete Vitamin B12 and they do have some drug interactions. Therefore, you need to always discuss the use of a PPI with a pharmacist. Your pharmacist may also recommend starting with another product like ranitidine because it is even safer to use, often just as effective and less costly. Fluconazole 150 mg capsules are an antifungal medication used to treat vaginal yeast infections caused by the yeast Candida in a single dose. It works by stopping the growth of Candida and your immune system takes care of the rest. It usually starts to work within one day, but it may take 3 days for your symptoms to improve and up to 7 days for your symptoms to disappear. You can purchase this medication on its own or in combination with an anti-fungal cream. It is also now available in a generic brand. Most women know when they have vaginal yeast infection so they can save a doctor visit and head straight to the pharmacy. Naproxen is a great anti-inflammatory pain reliever. It can be very effective for strained muscle injuries and sore joints. While Naproxen in 500mg and 375mg require a prescription 220 mg is available over the counter. When taking naproxen please avoid similar medications like ibuprofen (Advil) and high dose aspirin. Too much of this medication can irritate the stomach lining and long-term use can cause acid reflux and even ulcers. However; when used for short term pain relief it is a great low-cost option. If your stomach cannot handle oral anti-inflammatories you may get joint or muscle pain relief from Voltaren gel, which is applied topically. It is available in regular and extra strength. I always recommend this option over other topical rubs because the active ingredient diclofenac treats the inflammation. If the over the counter version are not as effective as you like the DCP compounds prescription strength diclofenac gel up to five times stronger than the commercially available product. Some of the products I have listed may benefit a prescription because they will be covered by Manitoba Pharmacare, NIHB, Income Assistance or a third-party plan through your employer. If you decide to purchase them over the counter, I almost always recommend the generic (Atoma) when available, as they are most inexpensive and just as effective. Remember if you are unsure of a diagnosis or not sure if a medication is safe, please talk to a health care professional, including your clinic pharmacist.